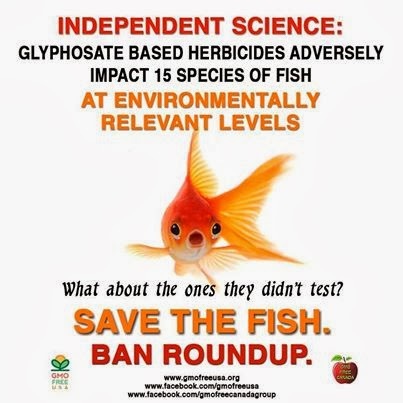 Fish impacted by glyphosate based herbicides at environmentally relevant levels. Tolga Çavaş and Serpil Könen (2007) Detection of cytogenetic and DNA damage in peripheral erythrocytes of goldfish (Carassius auratus) exposed to a glyphosate formulation using the micronucleus test and the comet assay. Mutagenesis 22(4):263- 268. Cattaneo, R., B. Clasen, V.L. Loro, C. C. de Menezes, A. Pretto, B. Baldisserotto, A. L. Santi, and L. A. de Avila. (2011) Toxicological Responses of Cyprinus Carpio Exposed to a Commercial Formulation Containing Glyphosate. Bulletin of Environmental Contamination and Toxicology 87, no. 6 (Dec): 597-602. Szarek J, Siwicki A, Andrzejewska A, Terech-Majewska E, Banaszkiewicz T. (2000) Effects of the herbicide Roundup on the ultrastructural pattern of hepatocytes in carp (Cyprinus carpio). Mar Environ Res. Jul-Dec;50(1-5):263-6. Albinati ACL, Moreira ELT, Albinati RCB, J.V. Carvalho, A.D. de Lira, G.B. Santos, L.V.O. Vidal (2009) Biomarcadores histológicos – toxicidade crônica pelo Roundup em piauçu (Leporinus macrocephalus). Arq Bras Med Vet Zootec. 61(3):621–627. Tierney, K. B., P. S. Ross, H. E. Jarrard, K. R. Delaney, and C. J. Kennedy. (2006 Changes in Juvenile Coho Salmon Electro-Olfactogram During and after Short-Term Exposure to Current-Use Pesticides. Environ Toxicol Chem 25, no. 10 Oct: 2809-17. Ayoola, S. O. (2008)Toxicity of Glyphosate Herbicide on Nile Tilapia (Oreochromis Niloticus) Juvenile. African Journal of Agricultural Research 3, no. 12 : 825-34. Cavalcante, D.G.S.M. ; Martinez, C.B.R. & Sofia, S.H. (2008). Genotoxic effects of Roundup ® on the fish Prochilodus lineatus. Mutation Research, 655, 41-46. Soso, A.B., Barcellos ,L.J.G., Ranzani-Paiva, M.J., Kreutz, L.K., Quevedo, R.M., Anziliero, D.Lima, M.,Silva, L.B.,Ritter, F.,Bedin, A.C., Finco, J.A. (2007) Chronic exposure to sub-lethal concentration of a glyphosate- based herbicide alters hormone profiles and affects reproduction of female Jundiá(Rhamdia quelen). Environmental Toxicology and Pharmacology 23, 308-313.